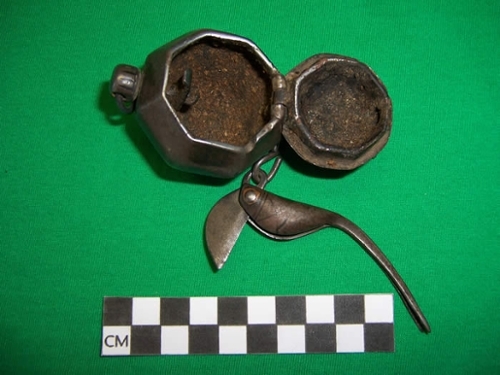 The smoking of opium and tobacco was a common recreational activity of Chinese and non-Chinese in Montana during the late 19th and early 20th centuries. 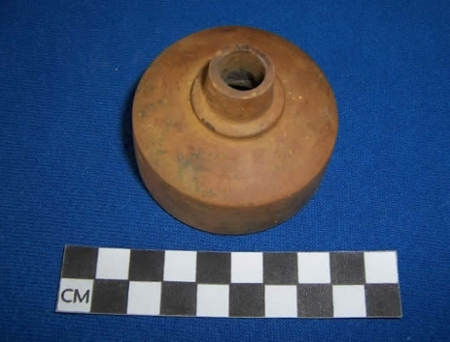 Over many years the Chinese created tools and instruments specific to the smoking of opium. 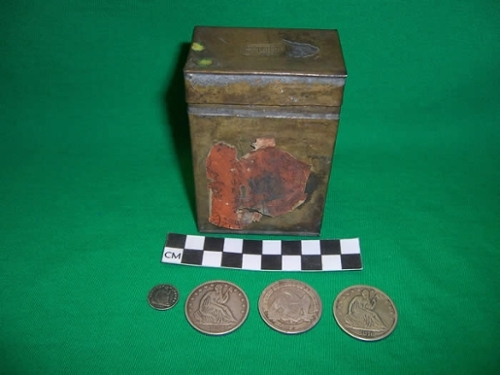 Archaeologists discover fragments of these types of items at sites in Montana and elsewhere in the United States, Canada, Australia, and New Zealand. Unless otherwise noted, all items on this page are in the private collection of Gary Weisz. In addition, all photos on this page are by Gary Weisz. 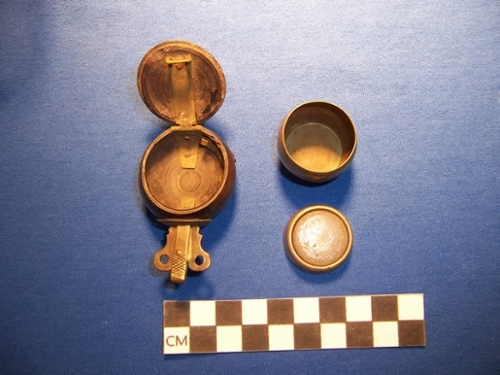 Brass opium can with cartouche, reconstructed from fragments found at a Chinese archaeological site in Montana associated with the Northern Pacific Railroad. 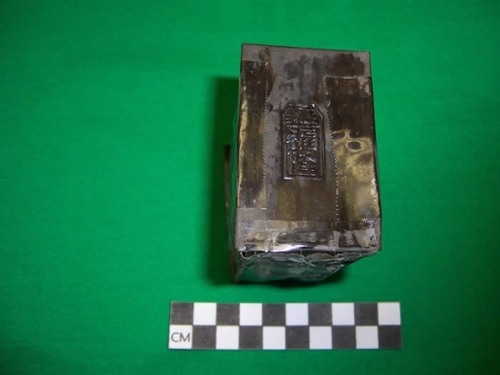 Brass opium can with partial paper label containing Chinese characters, from California. 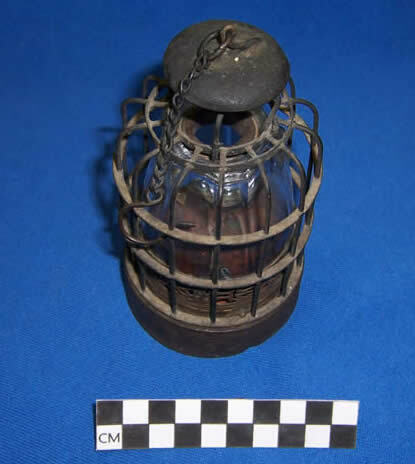 Brass portable opium lamp with protective cage. This specimen was used in California in the late 19th century. The cage has a chain and hook for suspension when not in use. Similar cages have been found at Chinese sites in Montana. 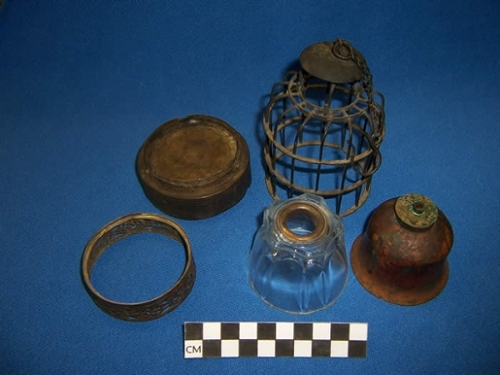 The deconstructed version of the above brass portable opium lamp with protective cage. This specimen was used in California in the late 19th century. Two bamboo opium pipes from Beijing, China. 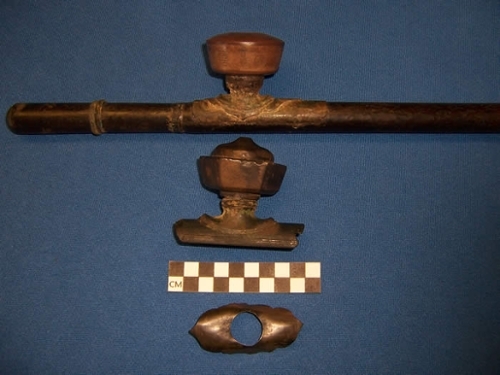 Top: Opium pipe made from bamboo, with bowl, saddle, and fitting still intact. 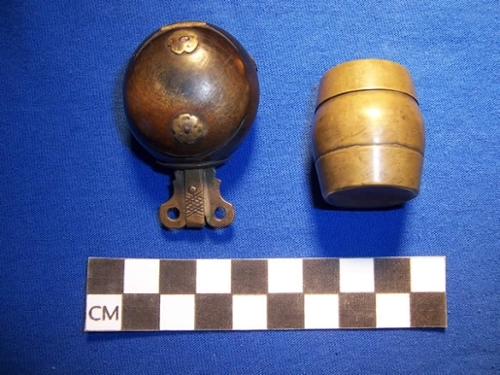 Middle: Ceramic pipe bowl attached to brass saddle. Bottom: Brass opium pipe saddle from a Chinese archaeological site in Montana. 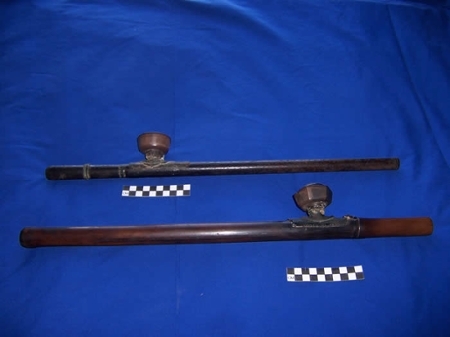 Opium bamboo pipe stem with its bowl and saddle removed, from Beijing, China. 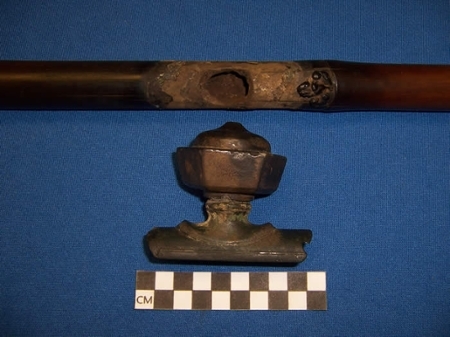 Brass opium pipe saddle found at a Chinese archaeological site in Montana. 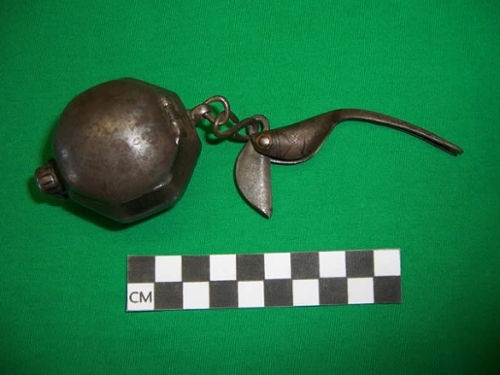 This saddle would be attached to a pipe as in the examples below. 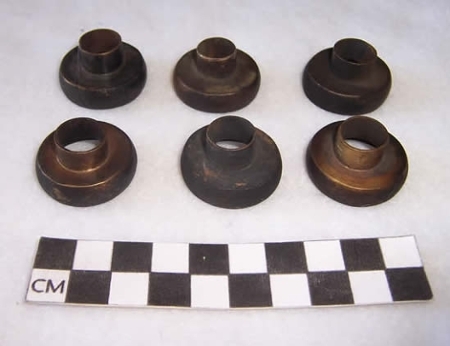 Brass opium pipe bowl connectors purchased from Beijing, China. 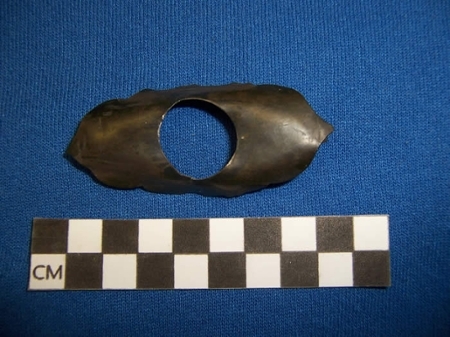 Similar opium pipe bowl connectors were found during excavations in German Gulch, Montana and Los Angeles Chinatown. 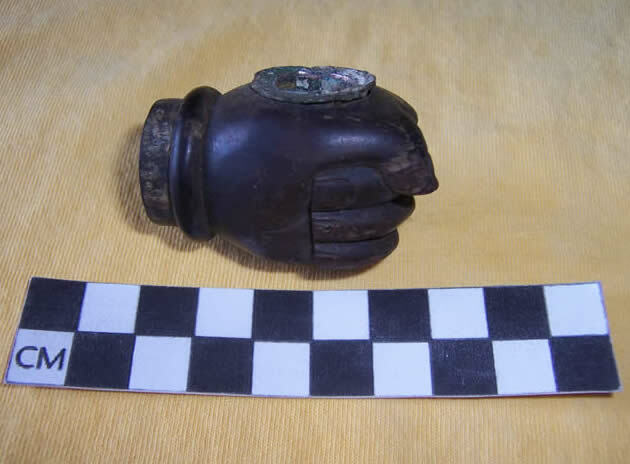 Wood end-piece from a Chinese opium pipe, clenched fist style, purchased from China. 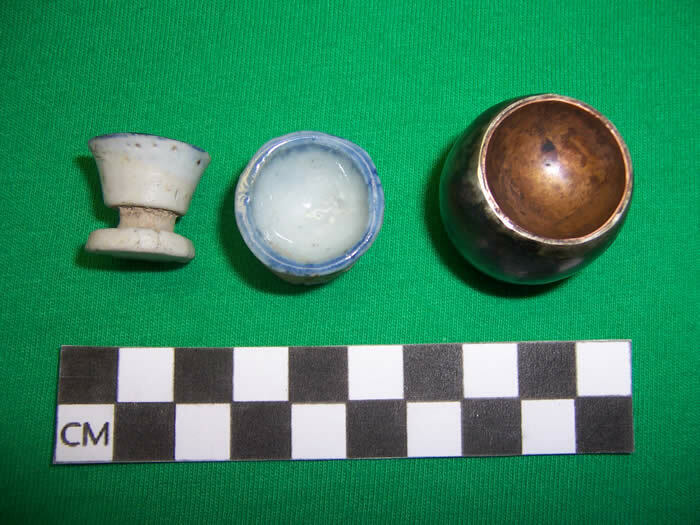 The ceramic opium pipe bowl was inserted into the hole which is visible in the top of the fist. 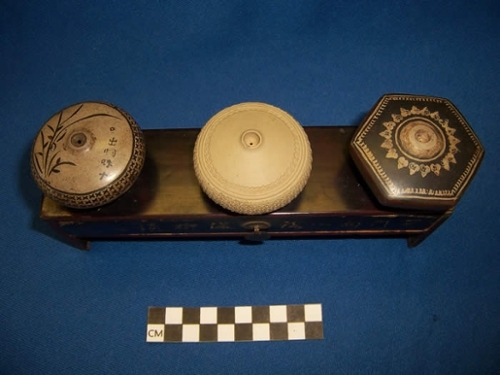 Three ceramic opium pipe bowls and a wood pipe bowl stand from Beijing, China. Six ceramic pipe bowls from Beijing, China. 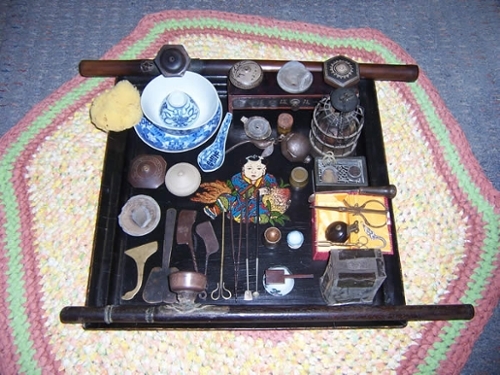 The bowl at upper left has a brass opium pipe bowl adaptor or sleeve to be attached to the pipe saddle. Bamboo pillow from Beijing, China. 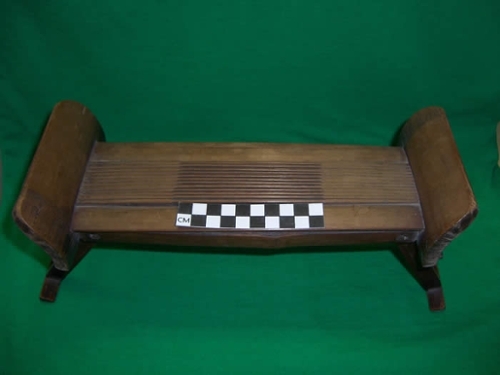 Pillows of wood and ceramic were often used to elevate the smokers head so he could view and manipulate the opium pipe and smoking paraphernalia. 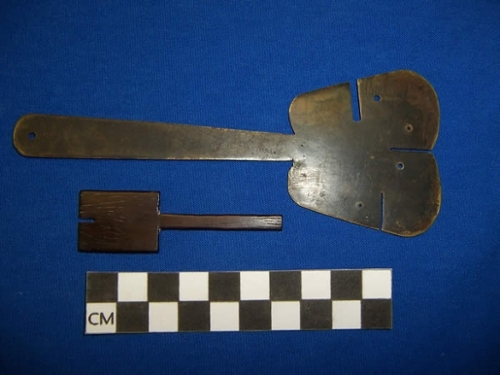 Brass opium tool stand purchased from Tianjin, China. 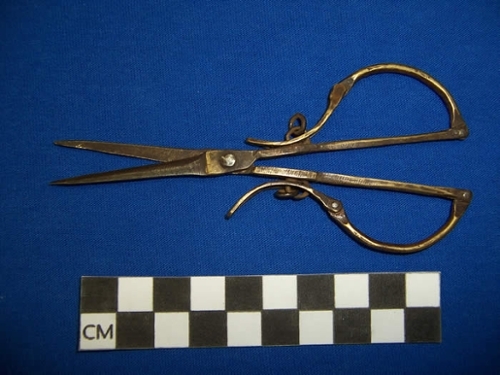 Brass Chinese scissors with iron blades, could be used to trim wick of opium lamp. Purchased from Beijing, China. Top: Brass opium needle cleaner. Bottom: Wood opium needle cleaner. Metal tweezers from Beijing, China. 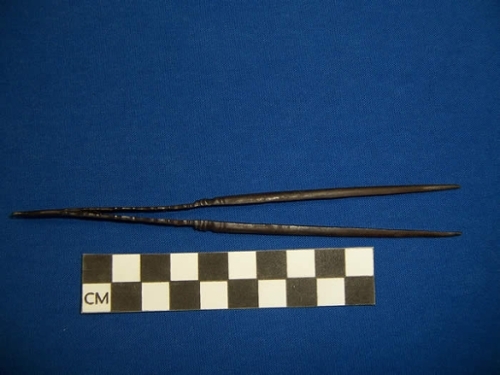 Tweezers were often used to adjust the height of the wick on an opium lamp. 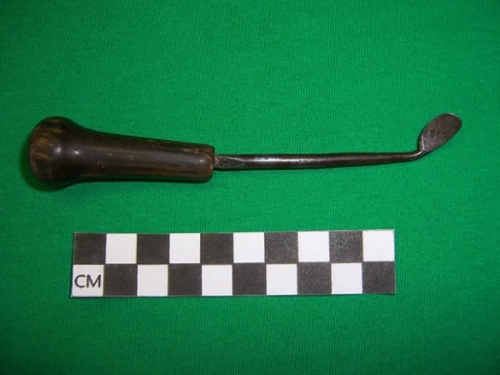 Metal opium pipe bowl scraper with wood handle from Beijing, China. These were used to scrape the interior of the ceramic pipe bwol to remove ash or dross. 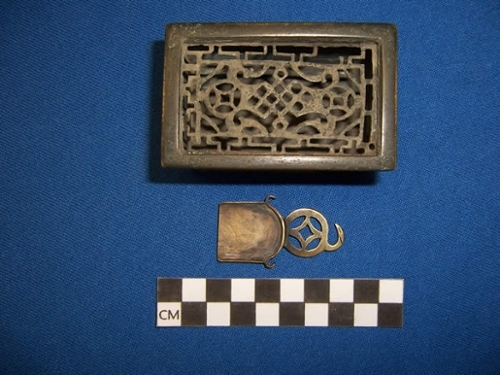 Iron opium paste box with attached iron combination knife/tweezer tool, from Beijing, China. Left: Closed box. Right: Open box. 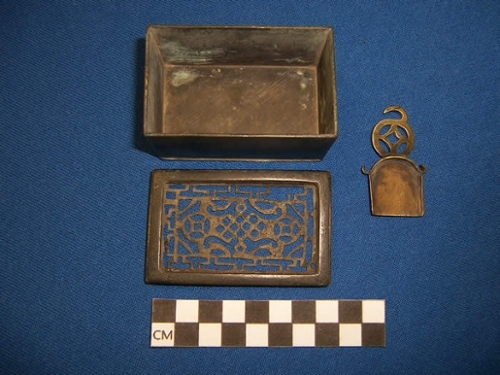 Brass opium dross or ash container and brass opium dust pan/shovel from Beijing, China. Opium dross was often saved and recycled for mixing with fresh opium paste. Note the Chinese coin designs on both the dross lid and pan. 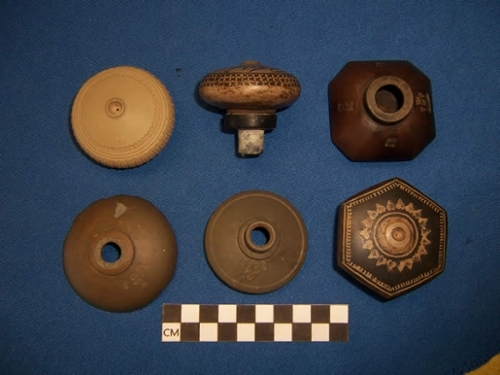 Two porcelain and one brass opium pill or pellet rollers from Beijing, China. It was necessary to work opium paste into small pills or pellets before the process of smoking began. 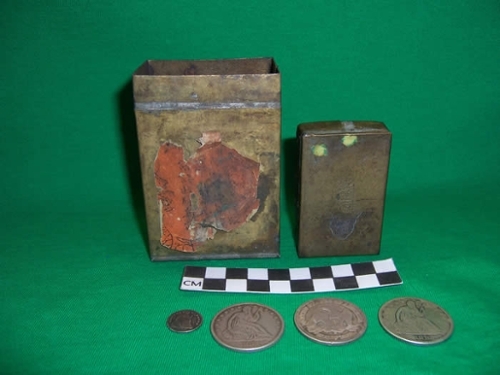 Two Chinese opium paste boxes from Beijing, China. 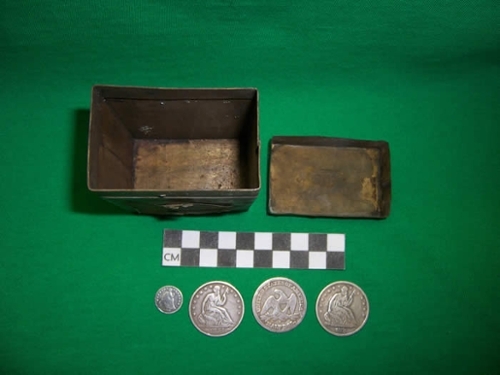 Boxes are closed in left photograph and open in right. 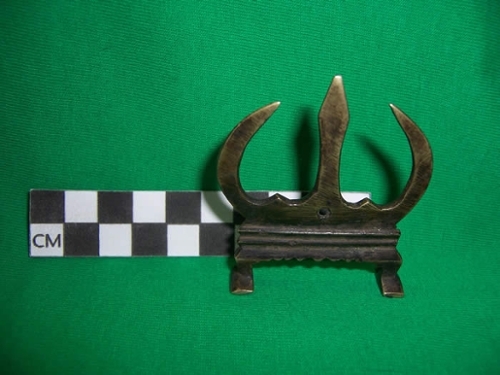 Example on left in photos is made from horn and right is made of brass.